Our Anti-Bullying Ambassador Team leads and promotes anti-bullying awareness and positive behaviour messages through school. We are very proud that our Anti-Bullying Ambassadors have received a national honour with the Diana Award, in recognition of the work they have led to promote anti-bullying and creating a safe, positive and supportive school environment. You can download the Diana Award Roll of Honour by clicking here. The official photos for the INSPIRE North event can be accessed by clicking here. We were delighted to be contacted by our local radio station Trax FM, who had heard about the fantastic work of our anti-bullying ambassadors and wanted to come and interview the children. We were very proud to hear our Anti-Bullying Ambassadors on the radio talking about their work and commitment to keeping our school bully-free. Well done to our Anti-Bullying Ambassadors, as their outstanding work to promote anti-bullying and their commitment to sharing best practice across schools in Doncaster has been recognised by Doncaster Council's Safeguarding Team. We are very proud to be one of the first three schools in Doncaster to receive this award. The Anti-Bullying Ambassadors team at ‘The Diana Award’, a not-for-profit charity, works in hundreds of primary, secondary and special schools of all ages/abilities in partnership with England’s Department for Education. The Anti-Bullying training aims to equip young people, staff and parents with the knowledge, confidence and skills to effectively promote anti-bullying in their schools and communities online and offline. To date the programme has trained over 20,000 young people from over 2,500 schools in England, Wales, Scotland and Ireland to be Anti-Bullying Ambassadors and help ensure that the time young people spend at school is happy, safe and bully-free. Ultimately Anti-Bullying Ambassadors are responsible for running Anti-Bullying campaigns in their schools and providing pupils with a friendly face their own age to talk to. Our Anti-Bullying Ambassadors invited all children and staff to wear odd socks to launch our Anti-Bullying Week – as bright and oddly matched as possible! We used this theme to celebrate our individuality and to reflect that being different is ok.
Our Anti-Bullying Ambassadors enjoyed organising and judging our 'odd socks' design competition and we were very impressed by the huge number of colourful and creative entries, just a few of which are pictured below. In Year 4 children wrote their own anti-bullying messages on a paper strip before putting them together to make a paper chain. A highlight of our Anti-Bullying Week was a performance by Eugene from the Magic Club of Great Britain. In a high energy, entertaining and humorous performance children were amazed by the magic skills and at the same time were given powerful anti-bullying guidance. At the end of the show children showed their thumbs up to share their support for anti-bullying! 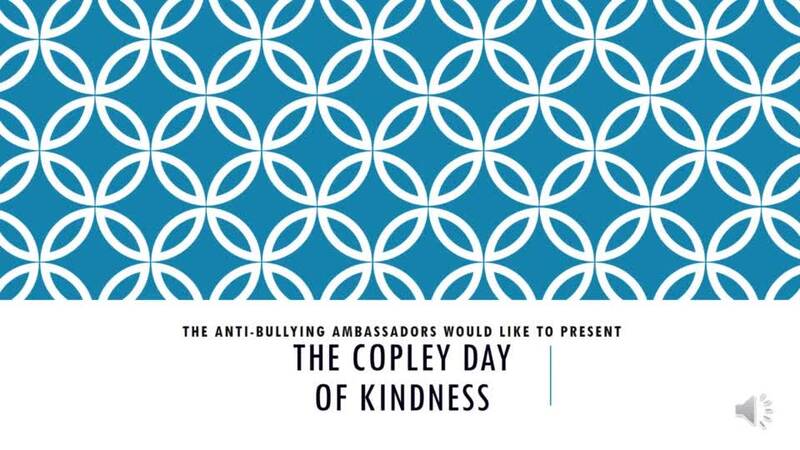 We decided to promote the positive behaviour we all want to see at Copley by organising 'The Copley Day of Kindness'. We presented our powerpoint to the whole school in assembly. Our powerpoint is shared below and includes our very own soundtrack! We asked children to concentrate on small acts of kindness and at the end of the week children in each class nominated two children for the 'Copley Day of Kindness Roll of Honour 2018'. It was very tricky to choose just two children in each class! In Year 3 children enjoyed taking part in role play activities to bring their poem alive. In Year 4, children considered positive strategies for resolving conflicts and then designed posters to share their ideas. Year 5 pupils reflected that it is everyone's responsibility to ensure bullying never happens at our school. They created art work to make sure every child knows that if they see a problem, they must speak up to help keep everyone happy and safe in school. Members of our Art Club produced these creative pieces on the theme of anti-bullying. Pearl Class wrote a non chronological report about anti-bullying, which gives some good advice. Year 4 designed anti-bullying posters during Anti-Bullying Week. Please find below two of the anti-bullying poems written by Year 6 pupils during Anti-Bullying Week. During Internet Safety Week all classes completed a survey on their internet use, which was followed up with discussion and class work. Our Anti-Bullying Ambassadors led a whole school assembly to encourage children to think about safety and stranger danger if they choose to communicate with someone online. Their PowerPoint presentation helped children to consider that although someone may appear friendly from their messages online, they may not be whom they appear to be and we need to be careful what personal information we choose to share online. Our Anti-Bullying Ambassadors encouraged all children to share any concerns with a trusted adult and we reminded children about the CEOP (Child Exploitation and Online Protection Centre) button as a means to finding out information and reporting concerns (for further information, visit our 'E Safety' website page or click here for a quick link). Our assembly finished with the message that as long as children use the internet safely it is a fantastic way to learn and have fun. Thank you once again to Eugene from the Magic Club of Great Britain. The children (and staff!) were thoroughly absorbed and entertained by the interactive magic show, which combined great humour, mystifying magic tricks and powerful messages about the dangers of cyber bullying and how to keep safe online. We were pleased to be offered the opportunity to attend Doncaster's Internet Safety Road Show. As well as finding out about new technologies and how to keep safe online, it gave children opportunity to work alongside children from other local schools. All children wrote their own message on a jigsaw puzzle template to show their commitment to #ItStartsWithUs 'Play your part, together we can build a better internet'. All the children in school wrote their own personal pledge about keeping safe online and these have been displayed around school. The Anti-Bullying Ambassadors led a competition across school for pupils to design a poster to remind everyone about the SMART e-safety rules. We had some fantastic entries! Our Anti-Bullying Ambassadors chose the creative 3D design below to be our winner, with a 92 piece art set as the fabulous prize! Well done to our Year 5/6 Anti-Bullying Ambassadors who worked independently to produce this child-friendly e-safety leaflet to give to all the children in school.Thank you to our Anti-Bullying Ambassadors for supporting pupils in school to be safe online.